Wu Wenguan’s pioneering documentary Bumming in Beijing and the innovative docu-drama Oxhide II by Liu Jiayin share an intense focus on the day-to-day lives of female artists in Beijing. They were made 20 years apart and each at a time of great turbulence in China’s recent history. 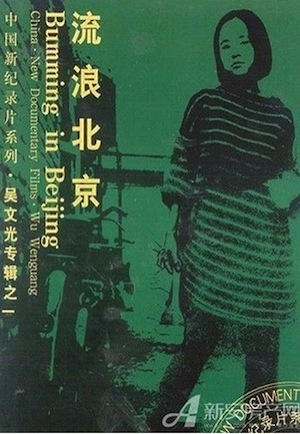 Bumming in Beijing was filmed in the run-up and aftermath of the Tiananmen Square protests of 1989, when China was instigating ground-shifting reforms of its socialist economic policies. Like the ‘after’ to Bumming‘s ‘before’, Oxhide II has the 2008 Beijing Olympics as its backdrop – the event that symbolically confirmed China’s status to the West as a dominant, state-capitalist economy. Female writer Zhang Ci and female painter Zhang Xia Ping are two of the five brilliant artist subjects of Wu’s documentary. Leaving government-assigned graduate jobs in remote provinces of China, they have come to Beijing to live as freelance artists. Rejecting domestic dependency and financial security, the women live alone relying on city-wide networks of friends for support. They become self-declared mangliu (“drifters” or “vagabonds”) – people without jobs or Beijing residential permits. The documentary is filmed in the cramped, dilapidated living spaces of artists who initially seem to succeed in making their art the centre of a footloose existence. Wu cuts repeatedly between their bedsits as they discuss themselves and each other, keeping the viewer feeling exhilaratingly mobile. You identify with the artists, as though you too were practicing Ceng Fan: the technique of waking up at noon, scanning your address book and cycling to a friend’s for lunch. After five o’clock, the process starts over for supper. In this world, where living is not easy, possibilities do not seem too limited. Artistic, social and even some economic opportunities are open to both genders – both the female and the male painter have individual exhibitions at the Beijing gallery and occasionally sell paintings to foreign tourists. There is even a sense of mobility between the genders. We see women with short hair and denim jackets, swearing and smoking, as well as charming, sylph-like men with long hair and delicate manners. Berenice Reynaud notes in her article that “what prompted Wu to shoot Bumming in Beijing was the writer Zhang Ci’s decision to marry an elderly American man who’d take her to the US.” Yet by the end of the film two of the male artists have also married Westerners and left: they are not too proud to reject becoming more mobile, even it if means marrying a wealthier, female Westerner. Men and women are united by their common artistic labour, which creates a sense of solidarity between the sexes that seems to surpass traditional gender binaries. Liu’s docu-drama Oxhide II is also set in a Beijing artist’s home. In this sequel to her 2003 debut Oxhide, Liu has again created a mild dramatisation of her own family as they make 73 dumplings in real time (two and a half hours making for blissful but hungry viewing). Whilst Wu in Bumming in Beijing also uses many slow, long shots of mundane activity, Liu’s use of the technique is more claustrophobic. The camera is held in nine static positions; shots are held for as long as twenty minutes. As a viewer you manoeuvre little, often seeing only arms or legs in the shots and only occasionally hearing the actors’ voices. The outside world is only talked about intermittently and when it does creep into the little flat, it sounds menacing. Mall managers threaten to cancel the lease on the father’s bag shop. A gossiping neighbour will malign the family if they lose the business. The family also has to worry about those beneath them on the economic ladder – their salesgirls who will struggle to find work if sacked. Liu makes sexist implications clear: her parents worry about the future of the “reliable” but “overweight” salesgirl. They predict that the ‘skinny’ salesgirl will find new work more easily. As well as selling a product, the salesgirl is expected to sell her own, preferably slim, image. Before the introduction of the market economy of the last 20-30 years, China had no product advertising aimed at women. The socialist government declared a devotion to equality between the sexes in dress and in work. In Oxhide II, the relative equality of the middle-aged mother and father’s relationship (where we see them sharing the labour inside and outside the home, and where the artisan father performs a lot of traditionally ‘feminine’ work such as cooking and sewing) is presented as somewhat old-fashioned. Gone are the days where women like Zhang Ci in Bumming in Beijing would be automatically assigned to edit a magazine (a job many current female UK graduates could only dream of!). In the China of Oxhide II, a young woman’s employment prospects have ceased to be skills-related and gender-blind. The female artist here is no drifter – this Beijing appears too hostile to support outdated bohemian behaviour. Presenting herself in a domestic setting, the director is 28 and lectures at the Beijing Film Academy. She cannot distribute her independent films within China due to censorship. The audience for her art is almost entirely foreign and her experimental style ensures she receives little commercial reward. Although this was also true for Wu 20 years before, the portrait of Beijing in Oxhide II is one with even less professional security despite the family seeming wealthier than the artists in the earlier film (indeed, in Oxhide II they eat pork dumplings, not the staple cabbage and potatoes of Bumming in Beijing). It is difficult not to agree with Reynaud who deplores the fact that in the New Chinese Cinema the number of women filmmakers has been limited due to the advent of market economy: only two of the nine films at the festival were directed by women. A female, Chinese, independent, experimental docu-drama maker will well understand how an artist’s work can be marginalised. In this light, Liu’s criticism of her father and his defence of the failing artisan business where he designs and makes the bags himself, in opposition to factory-produced goods, is down to his failure to recognise economic reality. The dream of being able to earn money through individual, original, creative work is a dying dream, not one of the future. Li Ruoqie, the curator of the inaugural London Chinese Independent Film Festival, sees the China of 20 years ago as poorer but more socially liberal, where women had more equal opportunities than they do now. Yet even in Bumming in Beijing the female artists struggle with their roles as both women and creative producers. They are the only ones interviewed who display emotional distress about their precarious lifestyles. Writer Zhang Ci desires female power, referring to America as the cultural centre of the world, a “mother’s womb” full of mystery and opportunity. Nevertheless, her method of getting there involves marrying an older American man. To reach this promised land of economic and artistic opportunity, she relies on his power. Her stated dream to “write something significant” competes with her desire to have a “nice house”. The film opens with a scene of her cooking and Wu often shows her performing domestic tasks, undermining our sense of her artistic vocation. We even see her asking her landlady about her laundry, which suggest a little uncomfortably that Zhang’s freer lifestyle is maintained by the domestic work of another woman. Zhang’s disappearance halfway through the film is sudden and difficult for the audience. Gradually more focus is given to the Zhang Xia Ping, the female painter and the only artist to disapprove of Zhang Ci’s act of “selling [her]self through marriage”. Zhang Xia Ping is utterly dedicated to her art. In her words: “I would rather sell my c*nt than my paintings.” The penultimate section of the documentary is devoted to her fragile mental health. Mou Sen, the theatre director, supports her, declaring that he and her “share the same soul” and that a true artist should be mad. However, it is hard not to conclude from Zhang Ci leaving for America and Zhang Xia Ping’s mental breakdown that even in potentially more liberal days being a female vagabond in Beijing was a bleak prospect. While Bumming in Beijing is doubtful as to whether a female vagabond can be successful, it seems to be accepted fact in Oxhide II that she cannot: the domestic has become the setting for art. The family table becomes the platform for the coming together of differing people through creative labour. As the single focus of the latter film’s nine shots, it is the only space in which the family members stop arguing with each other and instead communally make bags, dumplings and ultimately the film itself. The table, with its weathered and scratched surface, is where the identity of the makers has always become plastic, even when the world outside seeks only to limit them. The inspiring portrayal of art in both films suggests it has the potential to turn the maker into a gender-neutral figure who is open to different identities, whether sexual, racial or class-based. All images courtesy of L.C.I.F.F.